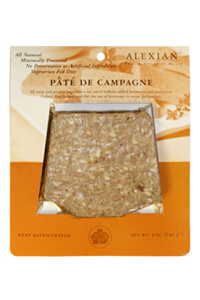 Pate de Campagne is made with pork and pork liver, along with sherry wine and special herbs and spices. It's a country style pate that can easily be sliced or served on toothpicks as an appetizer. While delicious on its own, the delicate flavors of this Campagne Pate are enhanced when paired with simple items like breads, fresh vegetables, wine and cheese - or when combined with a few ingredients in simple sandwiches or toasts. Ingredients:pork fat, pork, pork liver, onions, spices, sherry, salt, garlic.